In this chapter you’ll first find yourself in a dining room, make your way around the room collecting the studs, also destroy the stools to gain more studs. Head to the door on the left hand side and use the ‘Wingardium Leviosa (WL)’ spell on the disk on the door, this will release a few Lego bricks. Use the ‘WL’ spell on the bricks to build a cooker. Stand on the gold ring by the cooker and press the A button to push the cooker up the room. The cooker doors will open to reveal a cake inside, use the ‘WL’ spell on the cake to get the gnome to come down from the light fitting. The gnome will drop down from the light and drop a disk, pick up the disk by pressing the A button and place it on the door at the back of the room. Use the ‘WL’ spell on the disk that you put on the door and then the door will open and move you to the next room. (X6 Stud Multiplier Red Brick) – (Free Play Mode) Go back through the door behind you and go up to the watering can at the bottom of the stairs. Shoot the watering can to open it and use the ‘Aguamenti’ spell to fill it up. Use the ‘WL’ spell on the watering can to fill up the wash basin, then use the ‘WL’ spell on the dishes next to the wash basin to gain a key. Head to the bottom right of the room and use the key in the chest to gain the X6 Stud Multiplier Red Brick. Go back through the door, a silver man will come towards you, you need to shoot him to get a disk for the next door. (Wizards Hat) – (Free Play Mode) Switch to a ‘Strength Character’, I like to use Hagrid and go to the door with an orange handle. Press and hold the A button to open the door and jump onto the lift through the gap. Shoot the box to the left of the Phoenix, collect the item and give it to the Phoenix. Shoot the box to the bottom right of the room, collect the item and give it to the Phoenix. Stand in the middle of the yellow ring and press and hold the A button to transport your character to the next room. Use the ‘Reducto’ spell on the padlock on the chest and then use the ‘WL’ spell on the banana on the floor to move it to the other room. Head back through the yellow ring to the other side, collect the banana and give it to the Phoenix. The chest to the bottom right of the room will disappear leaving behind a Wizards Hat. Pick up the disk that the silver man dropped and place it on the door to the right hand side of the room. Use the ‘WL’ spell on the disk to open the door and make your way through the door. Go around the room and destroy everything you can for more studs, watch out for the moving book, you can shoot it to kill it which will prevent it from hurting you. (Regulus Arcturus Black Character) – (Free Play Mode) Switch to a ‘Dark Magic’ character (Professor Umbridge or Voldemort) use ‘Dark Magic’ on the red and black padlock on the door by the stairs and go through the door. Switch to a character is the ‘Deluminator’ ability (e.g. Dumbledore) and use the ‘Deluminator’ ability to move the light from one lamp to the other. This will melt the icicle and drop a blue brick. Collect the blue brick and place it on the picture to the left of the room. Use the ‘Reducto’ spell on the right side of the cabinet at the top left of the room and collect the handle with dropped on the floor. Place the handle on the pulley system at the top right of the room. Switch your character to a ‘Strength’ character and press the A button to pull the handle and move the cabinate. Use the ‘Reducto’ spell on the flooring where the cabinet was and then use the ‘WL’ spell in the hole to raise a ‘Parseltongue’ cabinet. Switch your character to Harry and press the A button to use the cabinet to gain the red brick, then place the red brick next to the blue brick. Go to the centre of the table and use the ‘WL’ spell to flip the central panel around and then use the ‘Reducto’ spell on the silver serving platter to reveal the green brick. Collect the green brick and place it on the picture with the blue and red brick. The Regulus Arcturus Black Character token will appear by the fire place. Now head up the stairs and use the ‘WL’ spell on the lights as you go up the stairs to put the steps back to normal and head up the stairs. Your task now is get the disk from the cabinet to open the door down stairs. In order to do this you need to switch character to Harry Potter and select the ‘Invisibility Cloak’ ability (Green Orb). Press the A button to the cloak on, this make Harry invisible to the ghost in the picture. Now move to the back of the room and press the A button again to remove the cloak. Go to the candle on the table, use the ‘WL’ spell and the directional buttons to make the candle destroy the boxes above the cabinet; this will cause a curtain weight to fall on the floor. Use the ‘WL’ spell on the curtain weight to place it on the curtain. Put the ‘Invisibility Cloak’ back on and go back to the other side of the room. Take the cloak off again by pressing the A button. Stand on the gold ring next to the handle and press the A button to close the curtain. Switch your character to Hermione and go to the cabinet at the back of the room. Press the A button and watch the sequence, select the squares in correct sequence to get the disk for the door. Go back down stairs and place the disk on the door, use the ‘WL’ spell on the disk to open the door and go through to continue. Now you’ll find yourself in a messy room, make your way around the room destroying what you can to uncover some items. (Free Play Mode) – Switch your character to a ‘Dark Magic’ character (e.g. Professor Umbridge) and use ‘Dark Magic’ on the black and red padlock to the left of the room. Press the A button to watch a cut scene. Use the ‘WL’ spell on the rug in the middle of room and go back to the picture and watch the cut scene. Use the ‘Reducto’ spell on the brown section on the floor which was covered by the rug and drop down the hole. Switch your character to either Fred Weasley or George Weasley and press and hold the A button to break the orange and purple Weasley box. Use the ‘Decoy Detonators’ ability to guild the other ‘Decoy Detonators’ to the orange and purple gates to destroy them. (Madam Pomfrey Character) – (Free Play Mode) Shoot through the boxes behind the far right gate and you’ll find the Madam Pomfrey Character token. (Wizards Hat) – (Free Play Mode) Behind the pallets your just shot you’ll find an item for the cauldron, collect the item and put it in the cauldron. Shoot the box to the bottom left of the room to find an item for the cauldron, collect the item and put it in the cauldron. Press the A button to pull the handle on the pulley at the top right of the room to lower a crate. Shoot the crate to reveal the third item for the cauldron, collect the item and put it in the cauldron. The cauldron will destroy the gates behind, shoot the box to the top of the gated area to gain a Wizards Hat. Head back up the stairs. (Game Play Mode) – Go to the yellow cog on the floor and press the A button to pick it up. Place the cog in the clock to the right by pressing the A button next to the clock. Go over to the yellow Lego bricks at the far right of the room and use the ‘WL’ spell on them to make a picture frame. The screen will focus on the picture in the frame, you’ll notice it’s jumbled up. Swap the top-left and the bottom-right pieces and swap the top-right and the bottom-left pieces to complete the picture. A yellow plaque will appear on the floor, use the ‘WL’ spell on the plaque to put it on the wall. Do the same with the green plaque towards the front of the room. Head over to the parseltongue cabinet and press the A button, watch the sequence and copy to get the cabinet to release the other cog for the clock. Once you have placed both cogs in to the clock use the ‘WL’ spell on the clock, this will give you a blue plaque. Use the ‘WL’ spell on the blue plaque to put it on the wall. Next to the clock is a ‘Quibbler Dispenser’, press the A button to open it and collect a pair of Spectrespecs. Go over to the translucent watering can to the far right of the room, the Spectrespecs will make the watering can visible and usable. Use the ‘WL’ spell on the watering can to fill up the fish tank. A red plaque will appear on the floor, use the ‘WL’ spell on the red plaque to put it on the wall. Now the door to the far left of the room will open and ‘Sirius Black’ will join your party. You’ll find yourself in a room with a death eater in front of the fire-place, use the ‘Expecto Patronum (EP)’ spell on the death eater target. Go around the room and destroy everything you can for studs. To the right of the room there are three vines covering a silver weight, use the ‘Lumos’ spell on the vines to release the weight. Now use the ‘Reducto’ spell on the weight to drop the next death eater down, then use the ‘EP’ spell on the death eater. Head to the bottom of the room where there are two silver weights, use the ‘Reducto’ spell on the weights to destroy them; this will make the shutter open and some Lego bricks will fall out. Use the ‘WL’ spell on the bricks to build a black chest, use the ‘WL’ spell on the chest to open it. Another death eater will appear, use the ‘EP’ spell on the death eater. Go to the other side of the fire-place and you’ll see a cabinet with a pipe going over the top. You need to switch to a character that has the ‘Pet’ ability, I like to use Hermione or Ginny. Use the ‘Pet’ ability by pressing the A button, get the pet to climb through the pipe and go to the end to push out the key on to the floor. Press the A button to switch back to Ginny. Pick up the key and put it in the cabinet to the right. The cabinet will open and inside it you’ll see a death eater, use the ‘EP’ spell on the death eater. Switch back to Luna Lovegood character and use the specrespecs to make the Lego bricks towards the back of the room visible. Use the ‘WL’ spell on the bricks to make a pump to blow up the last death eater, use the ‘EP’ spell on the death eater. A blue exit platform will appear in the middle of the room. (Susan Bones Character) – (Free Play Mode) To the left of the fire place you’ll see a pile of black and red Lego bricks, switch to a ‘Dark Magic’ character (e.g. Professor Umbridge) and use ‘Dark Magic’ to put the fire in the fire place out to gain the Susan Bones Character token. Now exit via the blue platform to continue. You’ll find yourself in a garden with a troll called Grawp. Make your way around the area destroying everything you can for studs and items. Switch to Ron’s character and use the ‘Pet’ ability to dig up a watering can from the centre of the area. Press the A button to change back to Ron again and use the ‘WL’ spell on the watering can and direct it towards the purple plant to create a large flower. Use the ‘Reducto’ spell on the flower head to get a petal to drop down. Now switch your character to Hagrid and use him to open the door at the back if the area with the orange handles. Switch back to Ron or Harry and use the ‘WL’ spell on the three petals lying around the area and use the ‘WL’ spell on the Lego pieces inside of the tree trunk to build a spinning flower. Jump onto the spinner flower to get blown up to the next area. (Wizards Hat) – (Free Play Mode) To the left of the devils snare you’ll see a wheel barrel, switch your character to a ‘Dark Magic’ character (e.g. Professor Umbridge) and use ‘Dark Magic’ on the wheel barrel to gain a Wizards Hat. Destroy everything you can for studs. Use the ‘Lumos’ spell on the devils snare by the wheel barrel and use the ‘WL’ spell on the item that is left to distract Grawp, causing him to brick up some Lego bricks. Use the ‘WL’ spell on the bricks to make box with a spring inside. Go to the lake and use the ‘WL’ spell on the yellow duck to put it on the spring in the box. Grawp will break up an accordion, use the ‘WL’ spell on the accordion to fix it and then use the ‘WL’ spell on the accordion again to get it to play to Grawp. A blue exit platform will appear in front of Grawp, use the platform to continue to the next area. You’ll find yourself in the Hogwarts Courtyard as the Weasley twins. Using either Fred or George Weasley, use the ‘Weasley Wizard Wheezes Box (WWWB)’ to break off part of the tree above. Use the ‘WL’ spell on the Lego bricks that fell from the tree to build a hammer and use the ‘WL’ spell on the hammer to open the gate. (Wizards Hat) – (Free Play Mode) Switch to a ‘Dark Magic’ character (e.g. Professor Umbridge). Use ‘Dark Magic’ to open the red and black grid on the floor to reveal a Wizards Hat in the hole in the floor. Destroy everything in the area and use the ‘Lumos’ spell on the vines over the cauldron in the centre of the area. Behind the cauldron is a statue, shoot the statue to release a skeleton, you need to use the ‘Reducto’ spell on the skeleton to the first item for the ‘Strength Potion’ and place the item in the cauldron. Use the ‘WL’ spell on the snake head at the back of the courtyard to get the second item for the ‘Strength Potion’ and place the item in the cauldron. To the bottom right of the courtyard you should find the third item for the ‘Strength Potion’ which was left from destroying the flowers, place this in the cauldron too. Now press the A button next to the cauldron to drink the potion and go to the gate with the orange handles at the back of the courtyard and press the A button to open it. Go up to the ‘WWWB’ and press the A button to get a pair of sucker pads which your character will put on. Go up to the orange, green and purple vertical walk way to get up to the platform above. Destroy the planks of wood across the hole in the wall by using the ‘Reducto’ spell and then use the ‘WL’ spell on the ‘WWWB’ to move it out of the hole in the wall. Press the A button next to the ‘WWWB’ to get it to destroy the wall so you can continue. Head to the left of the platform and pull the lever by pressing the A button to create a stair case to get back down safely. Now make your way through the exit to continue. In this area you will face your second round of duelling, you need to defeat two student and the third will flee from the duelling area. After the duel you can go around the courtyard to collect the studs. (Moaning Myrtle Character) – (Free Play Mode) Switch to a character that has the ‘Pet’ ability (e.g. Hermione) and use the ‘Pet’ ability to dig up the Moaning Myrtle Character token on the left hand side of the fountain. (Free Play Mode) Switch to Hermione’s character and go over to the ‘Bag Spot’ on the right hand side of the courtyard and use the ‘Bag Spot’ by pressing the A button to reveal a pile of Lego pieces. Use the ‘WL’ spell on the Lego pieces to create a flower fan pad. Jump on to fan to get onto the platform (roof) above to pick up some studs. Now continue through the castle door to progress to the next area. Head to the left of the room and destroy the first cabinet for studs. Above where the cabinet was you’ll see a cobweb, shoot the cobweb to get a key and pick it up. On the other side of the room is a chest, press the A button next to the chest to place the key, then press and hold the A button to open the chest. Use the ‘WL’ spell on the bricks to start building a fire work rocket. Head to the top right of the of the room and you’ll see a second cabinet with a large silver padlock on it. Use the ‘Reducto’ spell on the padlock to open the cabinet and release some Lego bricks. Use the ‘WL’ spell on the bricks to build another section of the rocket. At the top-left of the room you’ll see a third cabinet, shoot the cabinet to release some Lego bricks. Use the ‘WL’ spell to build a touch to the left of the bookcase and then use the ‘WL’ spell on the touch again to move the bookcase revealing an orange and green cage. Select the ‘Pet’ ability and press the A button to turn into a ‘Decoy Detonator’, move towards the cage and press the Y button to blow up the cage. Use the ‘WL’ spell on the Lego bricks to place the last piece of the rocket. Finally, use the ‘WL’ spell on the rocket pieces to bring it together. You can use the ‘Decoy Detonator Pet’ to destroy the rocket for more studs if you wish. A blue exit platform will appear in the middle of the room, use the platform to continue to the next area. Make your way around the room and destroy the tables, chairs and black board for studs. At the front of the room you’ll see two statues with gold rings in front of them. Press and hold the A button while standing on each gold ring and use the directional buttons to push the statues into place. The statue on the left hand side will knock down a flag which will drop a statues head, take the head to the statue on left hand side. Use the ‘WL’ spell on the head to put it on the statue and then use the ‘WL’ spell on the statue to make it open the box it is standing on. Use the ‘WL’ spell again to get the WWWB’ out of the box and press the A button to open the “WWWB’ box; this will destroy part of the pendulum at the back of the room. Go over to the pendulum and use the ‘WL’ spell on the pendulum to turn it around revealing an orange and purple walk way. Use the ‘WL’ spell on the other statue’s head to put it back on the statue. Then use the ‘WL’ spell on the statue to get it to open the box he is standing on and use the ‘WL’ spell again to move the ‘WWWB’ out of the box. Press the A button to open the box and the Weasley character will put a pair of sucker pads on him feet so that you can climb the walk way as you have done previously. (Vernon Dursley Character) On the other side of the broom stick stand you’ll see the ‘Vernon Dursley’ character token. Press the A button to mount the broom stick and use the directional buttons to move the broom stick. As you fly around you’ll see a number of shields, shoot the shields to destroy them. Then follow the rockets around the room and shoot them until they explode to finish the chapter. 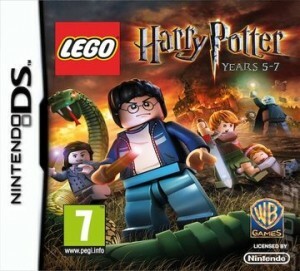 This entry was posted in DS and 3DS, Games, Lego Harry Potter Years 5-7 on January 18, 2012 by Tasha.